The Knudsen cell couples the Knudsen effusion method with a mass spectrometer. This experimental technique is useful for studying the equilibria between condensed or solid phases and vapours. Golden et al. (1973) used the Knudsen cell to investigate the kinetics of heterogeneous processes. At the TROPOS the uptake processes of gases onto surfaces are investigated. In more detail, the examination of absorption coefficients from various trace gases such as SO2, NO2 or HNO3 on mineral dust samples (Al2O3, Ti2O3, Arizona test dust, airborne mineral dust from the Cape Verde). In Figure 1 a scheme of the Knudsen cell is shown. 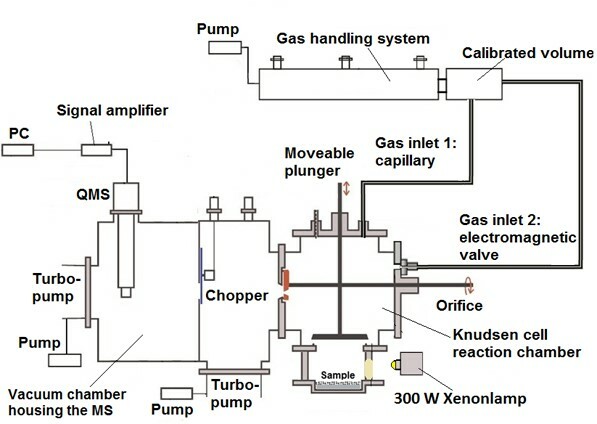 The Knudsen cell consists of three parts: (1) Gas handling system, (2) Reaction camber and (3) Vacuum camber. In order to conduct the experiments, the gas handling system is needed to adjust the necessary gas concentrations. The gases are entering the reaction chamber, a fluoropolymer-coated stainless steel cross, by two different ways, depending on the type of the experiment. In the steady state measurements, the gases are introduced constantly through a capillary. Conducting pulse experiments, the gases are introduced through an electromagnetic valve. 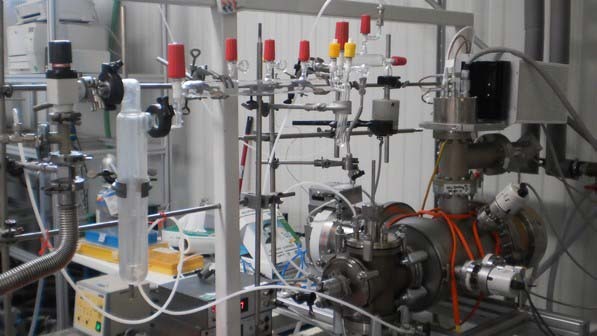 The reaction chamber is a high vacuum flow reactor and operating at very low pressures. Under these conditions, known as Knudsen conditions, the gas molecules collide with the cell walls more often than with each other. The solid sample under study is placed at the bottom of the reaction chamber and can be separated by a movable plunger. The gases were released from the reaction chamber through a critical orifice to the vacuum chamber housing the quadrupole mass spectrometer (QMS) for their detection. The residence time and the concentration of the gas molecules in the reaction chamber is determined by the adjustable diameter of the orifice. Golden D. M., Spokes G. N., Benson S. W. (1973) Very Low-Pressure Pyrolysis (VLPP); A Versatile Kinetic Tool. Angewandte Chemie International Edition in English 12 (7), 534-546, doi: 10.1002/anie.197305341.